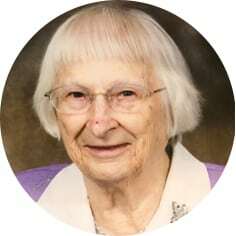 Katharine Boos (Mann), aged 96 years of Moose Jaw and formerly of Ernfold, Saskatchewan passed away peacefully on Sunday, January 20th, 2019. Katharine (Kay) was the eldest of 11 children, born in Regina, SK in November 1922 to John and Molly Mann. Her family lived primarily in the Morse/Ernfold area. Kay married Alex Boos in 1941. Together, they lived on and worked the Boos family farm south of Ernfold until 1968 when they moved to Moose Jaw, where she resided till her passing. She was predeceased by her husband, Alex in 2003; sons, Gary in 1999 and Ron in 2013; parents, John and Molly Mann; sisters, Mary and Lil; and brothers: Jack, John, Ken, Ted, and George. Kay will be sadly missed and lovingly remembered by her son, Glen (Lynette); daughters-in-law, Linda and Brenda; grandchildren: Kristin (Jason), Jerrad (Cyndee), Terri (Steve), Robin (Rick), and Jeff; 10 great-grandchildren and 1 great-great-granddaughter; sisters, Esther (Robert) and Iolena; brother, Ervin (Mary); as well as numerous other relatives. The Funeral Service will be held on Sunday, April 28th, 2019 at 2:00 p.m. in Moose Jaw Funeral Home. Pastor Doug Shepherd will officiate and interment will take place at Rosedale Cemetery. In lieu of flowers, donations in Kay’s name may be made to a charity of one’s choice. Arrangements are entrusted to Moose Jaw Funeral Home, 268 Mulberry Lane. Gary McDowell, Funeral Director 306-693-4550. Our thoughts and prayers are with the Boos families. We have many fond memories of our time spent at the farm. Sincere sympathy. May you find comfort in your memories. 1Corinthians 15 : 22 – 26.